Here is a large, festive vintage Christmas tablecloth. It is pink tulle with a pink felt scalloped border. 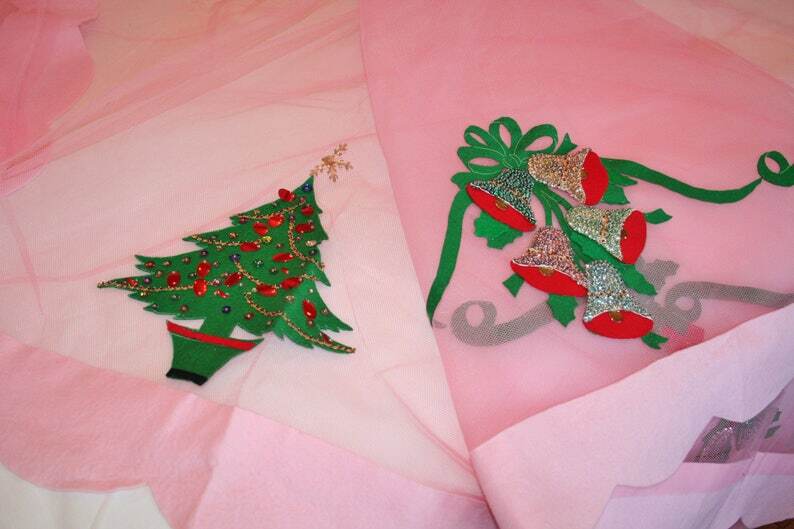 It has sequined and beaded felt trees, bells and some felt ribbon. It was completely handmade. I can't imagine how long it took to make! It's whimsical and vintage-y - just perfect for a casual and fun Christmas party! The tablecloth is 74 by 104 inches and is in good, but not excellent as found condition. There are a couple of light spots and I noticed one small hole in the border (see photo). Also there is a tear in one layer of the tulle. This tablecloth has two layers, so the tear is easily disguised. Even with some imperfections, this tablecloth is really special.